Shawn Reilly Simmons is helping us get ready for summer by matching her latest Red Carpet Catering Mystery, Murder on the Rocks, with the perfect drink. Shawn has worked as a book store manager, fiction editor, convention organizer, wine rep, and movie set caterer. She serves on the Board of Malice Domestic, is a member of the Dames of Detection, and is an editor at Level Best Books. If you’re anything like me, you’re longing for summer. Winter hasn’t taken the hint over here on the East Coast. She’s the last one at the party, worried we’ll forget about her over the next eight months while we’re sitting on the beach sipping fruit-forward cocktails. Luckily we have Drinks with Reads to distract us from the frigid temps! 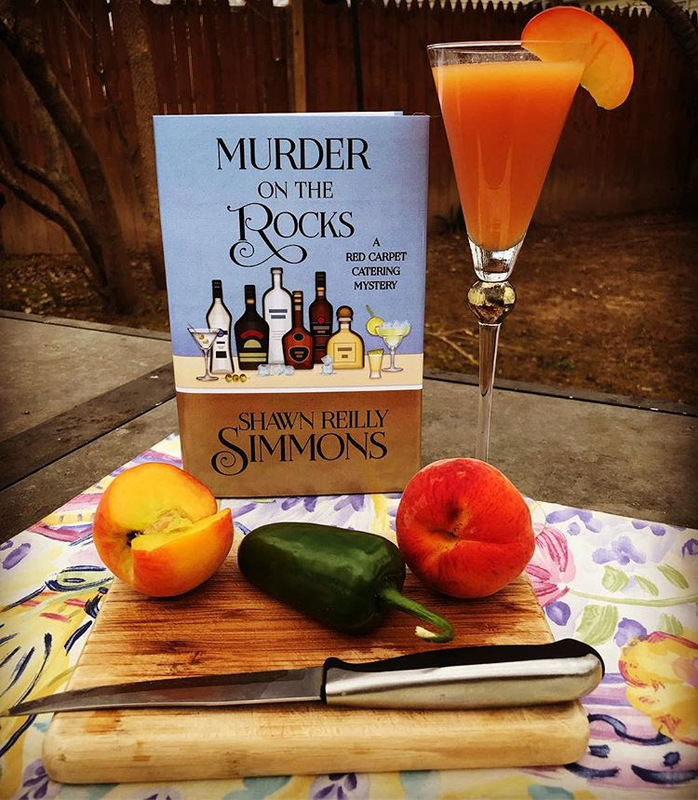 The fifth book in the Red Carpet Catering Mysteries is Murder on the Rocks, and just happens to feature a cocktail-themed cover. This time Penelope Sutherland and her movie catering crew are working on a film set in the mountains of Vermont. The co-directors, the Truegood brothers, are determined to keep the carbon footprint of the production to a minimum, which means Penelope’s team can only use locally sourced produce, much of it from the Truegood’s own garden, or get supplies from locally owned farms in the area. The tranquil setting is shattered by attacks on a tennis pro consulting on the film and other members of the crew. For a unique cocktail recipe to pair with Murder on the Rocks, I turned to my best friend of over thirty years, Julia Brugh (who happens to be a published author herself!). One of Julia’s many talents is creating vintage cocktails by putting her unique spin on traditional recipes. She’s also a Master Gardener, so it’s not surprising many of her creations feature fresh and in-season fruits and vegetables. It’s also fitting she chose to use a Vermont-based vodka that sources from honeybees, which are featured in the book. I’m beyond thrilled that Julia created a signature cocktail to pair with Murder on the Rocks, the Summer Sunset (recipe below). And I don’t care how cold it is outside, I’m pouring a shaker of these right now. Combine all ingredients in a cocktail shaker filled with ice. Shake vigorously until well chilled. Strain into a chilled coupe or champagne glass (or flute). Top with a splash of Prosecco or Club Soda (Optional). Combine one cup of water and one cup of sugar in a saucepan. Add half of a jalapeno pepper. Heat until the sugar is dissolved, lightly mashing the pepper with a wooden spoon at the same time. Allow to cool, with the jalapeno in the syrup. Once cool, remove the pepper, and store in an airtight container. Peel and dice 2 fresh peaches and process in a blender or food processor with water until smooth. Store in the refrigerator until time to use. I love the title of this book - Murder on the Rocks! What a great summer drink. I think any of us could use some summer at this point. I agree! It was sunny and 80 here yesterday (we went to a baseball game!) and today it's rainy and will be near freezing overnight. Can't wait for summer! What a great book cover and a great series. I'm excited to read this latest installment.